Ottoman tents are manufactured with optimum raw material and it can withstand in adverse weather condition. 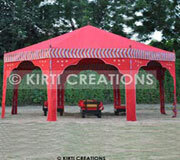 We have unique designs, colours, sizes and patterns of these tents. They are easy in installation and dismantling and are used for birthday parties, marriages and religious occasions. Ottoman Tents are well known for features like reliable, durable, and precise dimensions. This Royal Ottoman Tent is especially designed for or bringing warmth and style to the resorts. Installing Royal Ottoman Tents adds value to any resort and most importantly, it provides a comfy place to relax with your loved ones.